Please, help us make this directory of dance scholarships as complete as possible by sharing what you know. You will find a special form for this at the page. It’s been years since I first heard about the existence of Rudolph Steiner’s Eurythmy (not Dalcroze’s Eurhythmics but Steiner’s Eurythmy). As the dancer and choreographer that I am, I had attended their soft dances with some curiosity for their way of moving and particular expressivity. I also knew that there was some kind of philosophical system behind those choreographic forms but I had never had the opportunity to ask a dedicated practitioner about the passion for this special form of art of movement. After a conference about the topic by Eurythmist Libertad Aguilar, I had a further conversation with her which made me understand something that I didn’t know till then: eurythmic choreography is not about codified movements but about living a very special experience that she defined as of great contentment(with a sincere shining expression in her face while talking about it…). Contemporary-dance.org: You said before that the body of the Eurythmist should not be very tonic because that would allow her/him a greater permeability. Do you cultivate some kind of relaxed physical state or some special muscular tonicity? Libertad Aguilar: No, not all. For example, if someone who practices lifting weight wants to execute an eurythmic movement, s/he will have great difficulties. Eurythmy is about bringing a musical quality to the deepest within your self and transforming it into a living experience that becomes visible. You could learn the tones and the intervals and do it with your body, but you won’t get anywhere until you live it and let it really pass through you. This happens thanks to a conscious repetition in which your body is permeated by the sounds and becomes more and more sensible. When someone has too much muscular tonicity, it is more difficult that movement can be fluid, which is the quality of the eurythmic movement. CDO: Does this mean that there is a kind of feeling that something is going through you during the execution of movements? LA: Yes. That’s the idea all the time. CDO: So, if that feeling is not there, would movement be considered as empty? LA: If the feeling is not there but you are in the search, that’s valid. With my four years of practice, for example, I can not pretend to experience Eurythmy like my 80 years old master. She only needs to lift one arm and I already have a chicken skin. CDO: Does that mean that there’s also a particular expressive quality in movement that is full of that feeling? LA: Exactly. The goal is to truly achieve that the internal experience becomes visible. CDO: And how do you as a practitioner discover that internal experience? In which moment or why do you know that you are going through the experience? LA: That’s a beautiful question. When I arrived in Germany I saw a lot o Eurythmy and everything was good to my eyes. But in time you educate your ability to see. It’s like the first time someone sees a painting by Rembrandt. S/he might not see the quality of the light he achieved or the orange colors that appear… . It’s the same. The more you educate your eye, the more you can know when movement is really crossing the whole being. So, I dedicated my self to attend eurythmic performances and if you asked me where learnt more about it, I would say that it was observing it and not doing it; I was practicing at the same time, but watching is what awakened the awareness within my self of what an eurythmic movement is. It gave me the understanding of the difference between a physical movement and an eurythmic movement. That is something that wakes up progressively. CDO: So the more you practice, the more that awareness intensifies? LA: Exactly. You educate yourself and your ear. You develop the ability. CDO: Is the passion for Eurythmy connected with that feeling? …or with the aim to achieve that experience? LA: Yes. That’s the whole purpose. CDO: Is it the experience of a movement that has another sense? LA: It’s a movement that really goes through me and that belongs to me. CDO: Is it like an internal feeling? CDO: And how would you describe that feeling? Is it a physical thing or emotional…? LA: I will try to describe it with a banal example. I’m not sure if it will work. It is like when you go to an exam and you know all the answers perfectly. You are so sure and so completely conscious of what you are doing that you liberate your self from anything that does not belong into the experience, anything that puts something in doubt. It’s the most beautiful experience when there’s no place for doubt, but that is if you achieve it. You feel such a huge conviction that it is like if it was not yours but bestowed. CDO: That sounds like a feeling of contentment. CDO: I’d like to go back to a question about the codification of movement, as you said that some steps or exercises even have a name; each vowel and consonant has its corresponding movement; same with major or minor chords, etc. It seems that there are a lot of movements that are defined. Do you learn those? LA: What I tried with the previous experiential conference was to make people notice that it’s not that you learn those movements but that they live within our selves. I never told people, for example, that “A is like this”, “E is like this”, “I is like this”, etc. I tried to make people feel the quality of sound, how it affects the body and how the body can not respond in another way to that quality. So, it’s not a code but something that lies within our selves that becomes expressive through the body. CDO: So if ‘codes’ is not the right word, how would you call them? CDO: And how broad is the system of the eurythmic gestures. How many are they? LA: We work with the laws of the word and of music. For each law there’s a gesture. For example each interval, tone, phoneme, feeling or pause has its own gesture; motif changes are also made visible. Everything that is in a score has a corresponding movement. All that I can understand as a law within a poem or a score can be a gesture. There are many. CDO: Do you all share the same way to do those gestures and translations of the scores or are there differences among interpreters? LA: The principles are maintained, but when you create there might be different ways to proceed. In that case, the goal is to find the highest correspondence between poetry or music and movement. CDO: Had Rudolph Steiner already defined all those gestures? LA: No, not at all. There are still gestures being born. He created the starting point and expressed his wish for Eurythmy to be something big. CDO: Do therapeutic applications already exist? 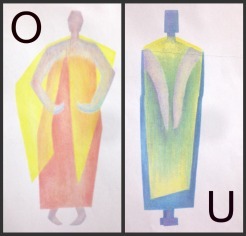 CDO: And what is believed that the practice of Eurythmy could heal? Psychomotor disorders or somethinglikewise? LA: In human beings, imbalances in the physical level also have a source in the level of the soul. Eurythmy would begin to search for the soul-spiritual cause. It is not a method to treat symptoms but to complete what is incomplete or restore harmony. CDO: You mean like balancing? CDO: The biggest question I have for Eurythmy comes from my intellectual background. I was educated as a very rational person and tend to not to be accepting of absolute precepts. So, I don’t know if I still don’t understand Eurythmy fully, but I perceive that there’s an ideological basis that presupposes that some kind of a ‘natural’ mode exists within human beings; and from that ‘natural’ reality arise all the gestures. From my Cartesian mind, I doubt about the existence of that ‘natural’ principles. 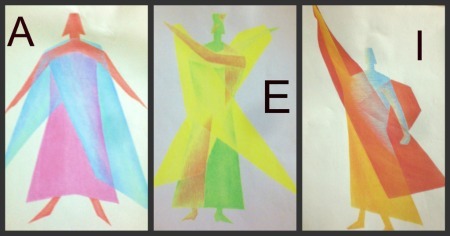 I wouldn’t have anything against Eurythmy if it were a system of codes. For me, the fact that something is a code does not mean that it is empty; it might just be a system of ideas, feelings or spirituality. So, do you really think that a person alone (without meeting anything of the eurythmic trend) could find and reach those same gestures or is this all a cultural construction? LA: I am convinced of the fact that this world is ruled by principles or laws. A tree does not grow downwards, for example. CDO: So, do you mean that there are definitely principles within the human being? LA: Yes. We are not disconnected. I also grow upwards. CDO: And are eurythmic gestures born from those principles? Studied Eurythmy “Art of movement” in Germany, in the Institute for Waldorf pedagogy “Witten Annen”. 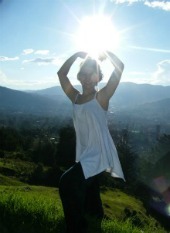 She is currently attending a specializing degree in artistic Eurythmy in Spring Valley, New York. Some of the pictures in this article are courtesy of Libertad Aguilar.